Potato doughnuts traditionally served on Shrove Tuesday, the day before the start of Lent. Originally done to use up lard and others of the typical foods that were given up for Lent. 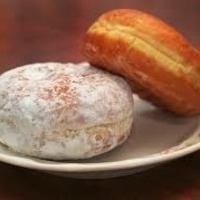 Many in Lancaster County, PA consider it good luck to have a Fasnacht on Fasnacht Day. Traditionally the dough was cut into squares and fried but new traditions have allowed them to be cut into doughnut shapes and the "holes" have become a treat. This recipe is from the Lititz Church of the Brethren (when it was on Center Street) and was saved by my grandmother Eva M. Koehler. Roll out and cut into doughnut shapes using a drinking glass and a communion cup (shot glass). Drop into hot lard (preferred) or oil, turn over and remove when golden brown. Dust with sugar or eat plain with King Syrup. I remember helping out in the basement kitchen making the donuts. First "job" was putting the donuts into a paper bag and shaking it to coat them. Donut holes, yum!